If you own a website, you want to manage it as easily and profitably as possible, right? As website developers and marketers, we want website success for our clients, including a quick ROI and a happy experience. Most of our business has come from referrals, so making it as easy and profitable as possible is a major goal. In 20+ years of building websites for clients large and small, we always tried to refine our process to make website development as easy and effective as possible. To do it right, website owners need to understand their target personas (audience), their needs, their competitors, the resources they have to invest, the technology they’ll use to build engagement or sell their products or services, the hosting…the list goes on an on. We discuss all that here. One thing is for sure, the biggest obstacle to building a website is writing content for a website. That includes not only page content, but blog posts and product descriptions. It might include scripts for audio or visual content and it definitely includes photos, icons or other images that help the visitor decide that they have found the solution they are looking for. It’s not easy writing copy that converts, especially if you haven’t done it much. That’s why some copywriters are very highly paid! And don’t confuse writing legal briefs, college textbooks, corporate reports, etc for the ability to create direct response copy on your website. It ain’t the same! It’s not easy to assemble non-text content, including images, pictures, downloadables, opt-in boxes and videos either, but it is really important! The framework and hierarchy are a significant part of the format and organization of the site. Once you have defined the goals of the website and the needs of your target personas, website content creation begins with a well thought out site hierarchy. It’s a key part of the plan! In the example above, we have defined the major sections of the website and prioritized the order of the NAV buttons left to right. In the circle, “Links to 13 other service pages” represents the sub-NAV of the site. A secondary NAV is often used in a sidebar menu. There are many keys to a successful website, but the two most important keys to website success are getting visitors (traffic) to the site and converting those visitors to buyers. We are focusing on website conversion today because it’s important to have a saite that converts before you start sending traffic to it, especially if you are paying for the traffic! For many website owners, getting the sale is their most important objective, but there may be interim goals that need to be met to win the sale, such as filling out a needs analysis, watching a video demonstration, setting an appointment, visiting your location or simply just making a call. Getting that content together is what we struggle with most. So You Think You’re a Copywriter? There are all kinds of writers and authors who write very well, but don’t write effectively for the web. In this article, we’re going to try and help. Writing website content is different than even writing blog content. 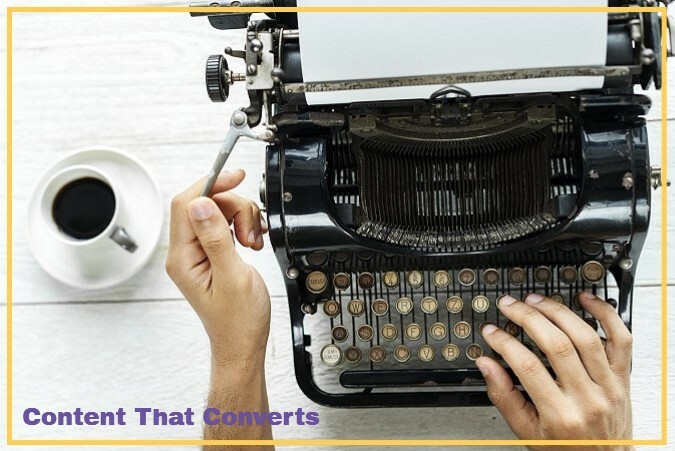 We had a client who thought her experience writing fiction would benefit writing website content, but unless you do it regularly, you simply don’t have the experience to do it effectively; whether writing for a website, magazine or publisher of fiction. Do you think a romance novelist would necessarily be a good direct-response copywriter? Do you think a talented writer of corporate communications would understand the format, voice and goals of writing a magazine article? We asked a client once to write down the 5 most frequently asked questions about a product they sell, and then write a couple of paragraphs answering those questions. Simple enough, right? We think those questions might attract people to the site AND answer questions before contacting our client. 6 weeks later, we still had not received the content and decided to interview the client and write the responses from the interview. It can be even more difficult with more content contributors. We built a website for a small restaurant chain in Chicago and asked each manager to provide copy points about their specific location. We did not ask them to write the content, just provide information about their unique locations, their slight differences in menu or the unique approach of their chef and services (some had banquet rooms, others did not, one was banquets only). It took nearly a year of asking, cajoling and the owners of the chain demanding their cooperation, not only in helping with text, but supplying photos of their locations. We have had client staffers who were assigned the task of working with us on content, who couldn’t get started because they were afraid the boss would not like what they wrote. We explained that website content is always a work in progress beginning with the first draft. It will be updated as needed. And it always can and should be updated. Why is Writing Website Content So Difficult? We’ve had so many clients who have struggled with website content that we really promote the idea of having a professional copywriter – especially someone with experience writing for the web – create the words and curate the images that will be used. And just as it is important for a blogger to have an Editorial Calendar, it’s important to have a content plan for your website. An Editorial Calendar is often created to plan content that will be of interest to their readers. It might include the types of content that will be created in addition to the topics that usually come from market research, competitive analysis and keyword research. Bloggers usually have a list of ideas to write about (or record, if they are vlogging), but pure website content tends to be a little more static. 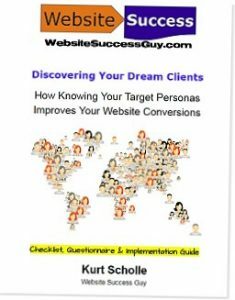 Your website plan needs to include the overall goals of the website with the target personas in mind. Every website has a ‘job’ and every page of the site has a ‘job’ supporting the overall goals of the site, which may go beyond sales, such as support to suppress returns or cancellations. This is one of the biggest obstacles to website success; not knowing what to write on each page. Having an outline of the new or revised site’s hierarchy can be beneficial. Consider including a keyword-rich editorial calendar too! This website hierarchy comes from a conversation we were having with a client. The squares in the top row represent the primary NAV of the website. The second row of rounded corner squares are the secondary NAV. The circle is a comment saying that there will be 13 other pages linked under Other Services. The yellow highlights represent page labels that we were discussing. Some prefer using a Mindmap to visualize website hierarchy. In this example for a senior center Naperville, IL, we also have hyperlinks, which identifies the exact page URL and makes it easy to access it. ProTip: A key component for website content are on-site and off-site links on every page. Every site has a Home page and Google may penalize you for not having an About or Contact page, so those are the first 3 pages we put in a hierarchy. You should have 1 or more pages related to the solutions you offer, whether product or service. I have a client who is a therapist who has all of her services listed on one page, but it’s best to separate them to separate pages to reduce confusion and appeal to the needs of the visitor. A blog can be very successful in attracting visitors based on Internet searches or traffic that comes from paid ads from Google, Facebook or even offline ads or direct marketing. We’ll talk more about creating an Editorial Calendar in a future post. You might have one or more private landing pages for people to do something, such as register for a webinar, fill out a form, watch a video, print a coupon, etc. Traffic to landing pages often comes from so sort of paid advertising. We recommend that you create a graphical outline of your site. Some use a Mindmap. Some create more of a process map, like this example made using PowerPoint. It makes writing content for a website much easier when you can visualize how it will be used. The goal of the page. What do you want to accomplish? The page’s URL. For those who are optimizing pages for organic search, you should include the Focus Keyword for the page in the URL. Where the page resides in the site’s hierarchy, such as a subpage of the Products page. You might label it Products->Widgets or even Products->Widgets->Ceramic. Links to onsite or offsite content. Links are very important to any content strategy and helpful to search engines. The contact information for anyone responsible for that page’s content. A section for miscellaneous notes. We like to put that information in a sidebar to the page for easy reference. You can add images to the CWD, but we recommend collecting them in a central area, such as a shared Dropbox folder. Stock photos and vector art vendors like iStockPhoto can be curated in a Lightbox, which can be shared with all project stakeholders prior to the images being purchased, which is when they should be moved to Dropbox. Organize website image content using a lightbox. Done right, your content creation and revisions will result in more engagements and sales, but will be evidenced by the site’s analytics. Here is a week-by-week look at a client site where we revised the site’s content. In this example, see an increase in Pages/Session and Average Duration with a corresponding drop in average Bounce Rate beginning with the week of May 6th. Notice that the % of New Traffic has gone down, which indicates that more visitors are returning to the site, which indicates more interest. That is also reflected in increased Duration and a drop in Bounce Rate. We have discussed that creating content that converts is one of the most important parts of website success. To begin writing content for a website starts with a well-planned website hierarchy and that every page on the site has a job. Once each page is defined, we begin curating content that supports the job of the website; including text, logos, icons, pictures, videos, downloadable reports/PDFs, links to other pages and sites and email opt-in forms. Using Word or Pages or some other word processor to curate copy points that eventually become the content and document the goal/job of the site and the non-text components on each page. Images should be collected in one location, such as Dropbox. If you’re buying stock images, using the vendor’s Lightbox helps organize those images as well as making them available to share with others for consideration. Create a Lightbox for every stock photo vendor you’re considering.